Dr. Charles Severance, of the IMS Global Learning Consortium. 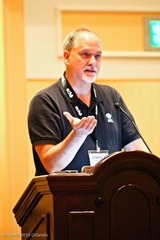 He is the leading voice of the leading organization in interoperability for systems handling teaching, learning, and course data. He was at Blackboard’s Developer’s Conference this year (sniff…I was not), as well as Blackboard’s general user conference where I met him. The IMS Global Learning Consortium is THE standards organization, working out standards which, when adopted by the leading vendors, make interoperability a shoo in. A few years back Blackboard became an IMS Global Consortium key sponsor, and participant, and assigned one of their top developers, John Fontaine, to a new role, that of "Senior Director of Technology Evangelism." Frankly, even though I know John and like him alot, I figured it was a marketing job….that his primary role was one of improving Blackboard’s image and making Blackboard seem like a good guy. So, it was with some surprise that I found Dr. Chuck speaking the last day of the conference. (The program said John Fontaine was speaking on Blackboard’s work with IMS Global and support of standards. John ended up having to be somewhere else.). You’ll see the link above for Dr. Chuck goes to his blog, where he echoes Blackboard’s announcement of support for the interoperability standard for course content (think of the tool you need to migrate courses from one LMS to another! ).